In 2014, the EHF campaigned towards EU decision-makers to oppose One of Us, the new European anti-choice offensive on research and maternal health. One of Us was a European petition requesting the “protection of the human embryo” in Europe and the end of EU funding for “activities that assume or carry out the destruction of human embryos”. More specifically, it called for the end of EU funding for human embryonic stem cells (hESC) research and for NGOs which provide sexual and reproductive health and rights (SRHR) services in developing countries. Because they reached the required number of signatures – 1 million – to be officially presented to European institutions, the organisors presented their request at the European Parliament (EP) on 10 April 2014, in a public hearing . They were rejected by both the EP and the European Commission, on fair grounds. In spite of this clear opposition, the One of Us organisors turned into a federation and have kept lobbying with similar demands since then. Alert the media on the extremist religious lobbying acting at the EU level. This initiative was funded by the Italian anti-choice organization Fondazione Vita Nova (50 000 euros). It was officially supported by Pope Francis and was represented by Patrick Gregor Puppinck, Director of the European Centre for Law and Justice (ECLJ), an Evangelical anti-choice NGO based in Strasbourg (France). The ECLJ is the European part of the American Centre for Law and Justice and has specialized in litigation at the European Court of Human Rights where it attempts to limit recognition of LGBT’s and reproductive rights. 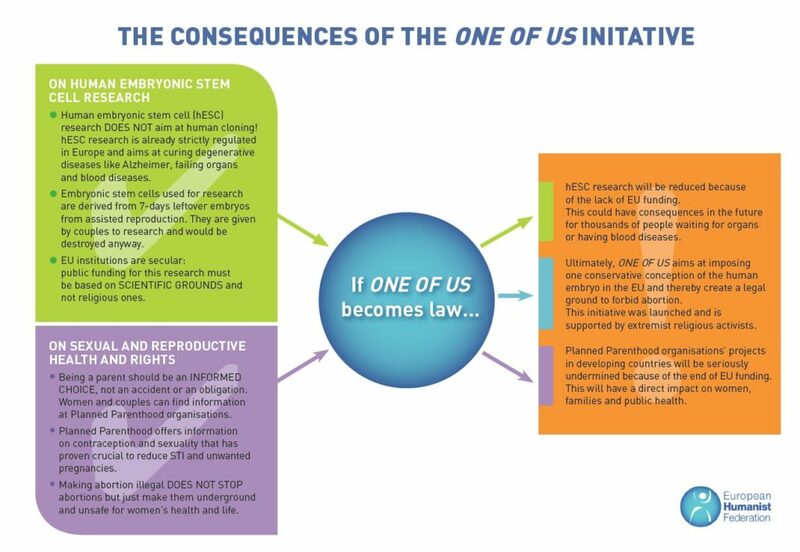 Many national “One of Us” partners were local anti-abortion movements and this initiative has received clear support from bishops’ representatives at the European level (COMECE). Furthermore, the organisers of this initiative misled their supporters with an incorrect reading of the EU treaties and a manipulation of legal instruments, ignoring EU’s commitment to reach Millennium Development Goals. What is a European Citizens Initiative? What does One of Us want? Who is behind One of Us? What’s wrong with the legal basis? What are the consequences on research? What are the consequences on SRHR and maternal health in developing countries?